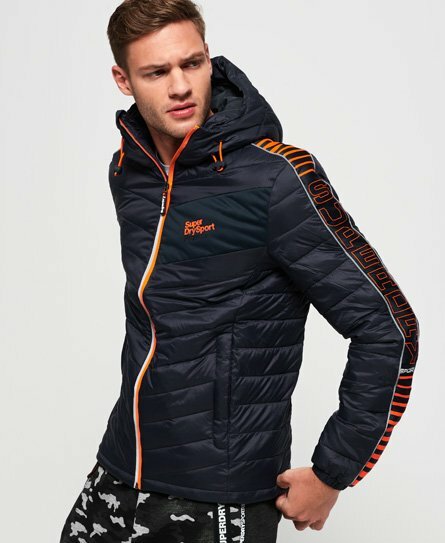 Superdry men's Tech Flex Fuji jacket. Look the part as you head to and from the gym this season in the Tech Flex Fuji jacket. Featuring a bungee cord adjustable hood, single layer zip fastening and elasticated cuffs, this jacket has been designed with your comfort in mind. Thermal properties help keep you warm, while the adjustable hem means you can alter the jacket to your perfect fit. This Fuji is completed with reflective detailing throughout, a Superdry Sport logo on the chest and panel logo detailing down the sleeves.